This is a significant letter, in spite of its brevity. It is the first mention of John W. JACKSON being a cousin of Sir Thomas JACKSON (1841-1915) and could very well lead to other branches of the family. Thanks to Pat Roberts and John McAnally for their input on various aspects. NOTE: This letter is undated, but is likely 1999, the year that Thomas Jackson was knighted for his work in Hong Kong, primarily with HSBC. If it is later, it may be that it is in reference to Thomas Jackson being made a baronet. 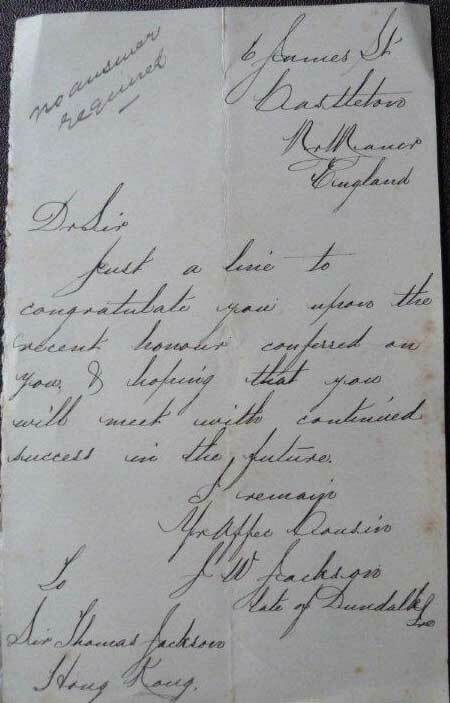 This letter is in a private family collection in Devon. I cannot yet place John W. JACKSON in the immediate family of Sir Thomas Jackson, but some census records at Castleton are a starting point. This photo was taken by Metropolitan Photography, 22 Westmorland St., Dublin #7463. 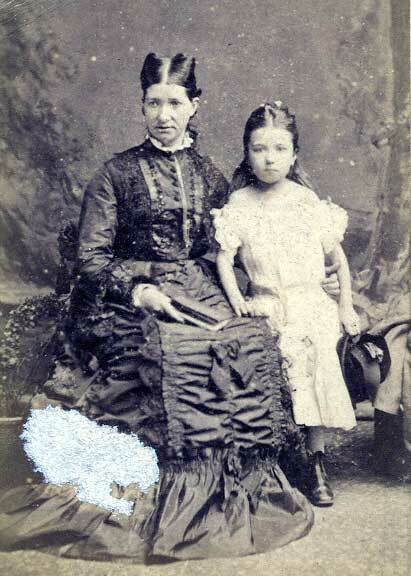 Written in pencil on the back "Mrs. Jackson & Janie of Dublin". It was in the collection of Thomas Andrew JACKSON and was given to me by Thomas.I do not know if it is connected to this letter in any way. Castletown is about 1.2 miles south-south-west of Rochdale and is part of Greater Manchester, although it was historically considered to be part of Lancashire. It merged with the County Borough of Rochdale in 1900. It was a cotton mill town, and grew rapidly in the 19th Century. A local church is St. Martin’s Church of England. SOURCE: Wikipedia. Sir Thomas JACKSON (1841-1915), HSBC Manager and son of David JACKSON & Elizabeth OLIVER. He is related in all likelihood, to Sir Thomas but exactly how, I cannot say. In a letter from 1893, Eliza Jackson, the mother of Sir Thomas Jackson says: I had another letter from England. John W. Jackson’s foot is not yet so well that he can wear a boot. I sent him the remaining two pounds today. Another earlier letter referred to money sent to J.W. JACKSON. In order for John W. Jackson to be a Jackson cousin of Sir Thomas, the connection would have to go at least three generations back. Sir Thomas’s father had only sisters, as did his grandfather, and most of their issue is accounted for and none of them married another Jackson. The closest generation where there is a possibility for a Jackson “cousin” to emerge would be a child of Sir Thomas’s Great grandparents: George Jackson (1718-1782) & Margaret O’Laughlin (abt 1720-). George and Margaret had two other sons: John and George, and the timelines would fit for their sons. Other than that, he may be a descendent of one of the Jacksons mentioned in the Jacksons of Tullymore document. NOTE: There is a probate for a John William JACKSON in 1906 of 140 Old Road Blackley, Manchester. He left a wife, Alice and effects of 141 pounds, 8 shillings. On Dec 22, 1876, a John William JACKSON (probably not the same one) married a Sophia SHEKLETON in the Dundalk Parish Church. I have looked at records of JACKSONs in Dundalk, but there are no slam dunks with respect to John W. JACKSON's exact relationship with Sir Thomas Jackson.